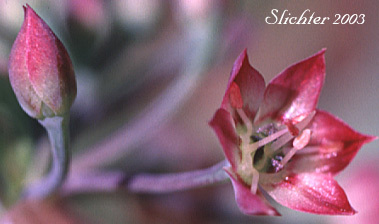 The photo above shows the inflorescence of two-stemmed onion from the head of Fish Creek, the Steens Mt.........July 17, 2000. The photo at right and two-stemmed onion from the head of Fish Creek, the Steens Mt..........July 17, 2000. Two-stemmed onion is a brightly colored perennial wildflower with a single scape rising about 10-20 cm high from a globose bulb. Larger bulbs may produce 2 or 3 scapes. The 3 (usually) leaves are erect and shorter to about equal in length to the scape. They are channeled, usually concave-convex in cross-section and from 1-13 mm wide. The scape is terete in cross-section. The bracts are lance-ovate in shape with long, acuminate tips. They are up to 15 mm long with 3-5 nerves. The inflorescence is a 20-30-flowered umbel. The stout pedicels range from 10-25 mm long. The flowers are a dull rose-purple with greenish bases (See photo below.). Each of the 6 tepals is 7-10 mm long. 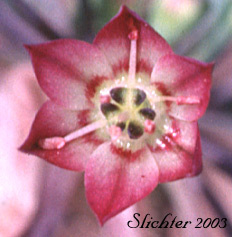 The outer tepals are broader than the inner tepals (See photo below.). The stamens are shorter than the tepals. The filaments are opposite the tepals. The ovary is topped with 6 high, thin crests. Two-stemmed onion is a plant of meadows and aspen stands in the mountains. It is occasionally found on open slopes. 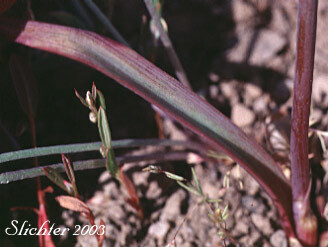 Two-stemmed onion may be found east of the Cascade and Sierra Nevada Mts. from Klamath County in southern Oregon south to Inyo and Shasta Counties in California. 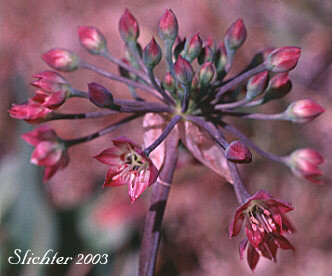 It is found in mountainous areas across northeastern California, northern Nevada and to the Wasatch Mts. in Utah. It is found across south-central Oregon (from southern Grant County) to the Steens Mt. into southern Idaho. It is also found near the Selway River in Idaho. 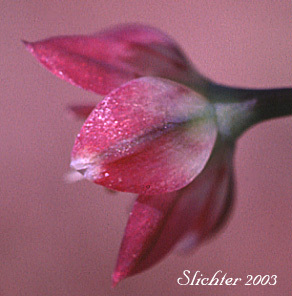 A close-up of the flower of two-stemmed onion. Note the dark crests atop the ovary. The channeled leaf of two-stemmed onion.